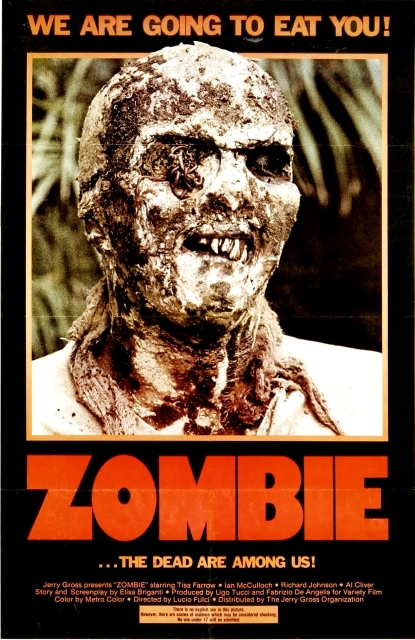 31 FLAVORS OF HORROR #16: ZOMBIE 2 (1979). We figure that the battle would take place in an enclosed space, in shallow waters, where there’d be enough depth for the bear to stand and the shark to swim. My own argument tends to emphasize the underrated fearsomeness of bears — bears catch fish, it’s what they do — but see, I’m already getting off topic. As the resident film-obsessive, I’ve been inevitably asked the question, “Has there ever been a movie where zombies attacked a great white shark?” It’s a great idea – mindless undead eating machines taking on the world’s oldest and most perfect toothy eater from the sea. Well, to my knowledge, there’s never been that exactly. That’s the bad news. 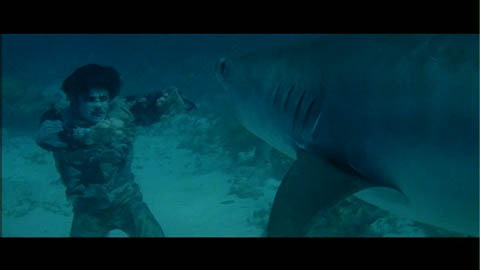 The good news: There has, in fact, been a movie where a zombie fought a tiger shark. I can’t rightly recommend a beginning-to-end screening of the movie. Here’s what it does have to recommend it: Some interesting, grisly, zombie make-up, a legendarily-gross scene of eyeball damage (not really my thing, sorry), a cool shot of zombies ambling across the Brooklyn Bridge, and a great, eerie title theme by composer Fabio Frizzi. Besides that, crucify me if you dare, but I don’t think Zombi 2 is all that good. There’s a major disconnect between what the movie’s fans seem to want it to be and what it actually is. It happens. Also, as you’re about to see, the marquee fight is not as stellar as you’ve been dreaming about. The shark’s teeth have clearly been removed entirely (where was the ASPCA on this?) and the zombie just kind of grabs onto the shark and hugs at him, at one point bloodily chomping on what’s supposed to be a fistful of sharkhide, but so obviously isn’t. So sadly, it’s not much of a fight. But for fans of interspecies underwater ballet, you’ve hit paydirt! This scene is slow, weird, almost dreamy – certainly worth watching if you’re so inclined. But there’s still room in cinema for this scene to be topped. 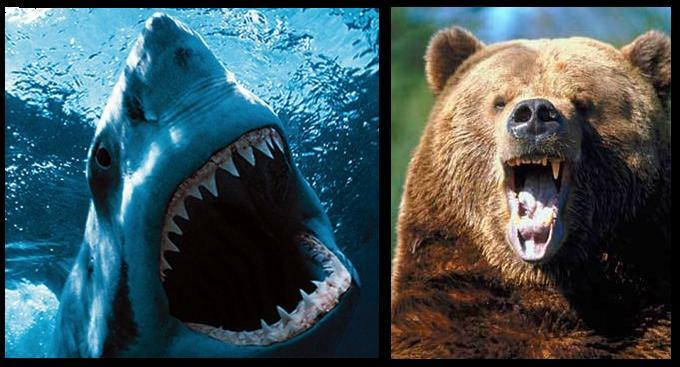 Some freak somewhere is thinking up the ultimate shark/zombie battle. Guaranteed. That freak might even be me… although right now I’ve kind of shifted my attention to the idea of a polar bear fighting a ninja. Zombi 2 is playing on October 21st and 22nd in limited cities across the country, including NYC’s Landmark Sunshine Theater, LA’s New Beverly, and Yellow Springs, Ohio’s Little Art Theatre. (Look for showtimes here.) A repackaged DVD from the great Blue Underground label follows on October 25th. Portions of the preceding article have appeared elsewhere on the internet, believe it or not. 31 FLAVORS OF HORROR #15: FRIGHT NIGHT (2011). 31 FLAVORS OF HORROR #17: ARMY OF DARKNESS (1992).